Oh je, nun ist sie über uns gekommen, die Faulheit, über die wir noch vor einiger Zeit so munter schrieben. Und es kommt noch toller, kommende Woche machen wir erst einmal Urlaub. Wir müssen uns nämlich dringend vom Nichtstun erholen. Aber danach wird wieder “anständig” geblogged – versprochen, großes Buchfeenehrenwort. This entry was posted in Norfolk, England and tagged Area of outstanding natural beauty, Cley next the sea, Nikon D800, North Norfolk, The Marshes. Bookmark the permalink. A nice open view of the filed that seems to run into the deep blue sky. Nice. Yesterday we had 22 degrees C but today it’s cold again, 9 degrees C only 😉 but warm and sunny weather is forecasted again for tomorrow. We had no winter this year but the spring isn’t really warm. indeed, you are right we could come home from Cambridge for the night, but we go to Cambridge for a couple of days. Actually we don’t go to the city but we are invited to the Wimpole estate where we want to see the famous library there. We are already quite excited. ….. jajaja, so geht es manchmal – es sind Zeiten, wo man richtig faul wird…! oder eben was Anderem mehr Priorität zumißt. ganz herzlichen Dank für deine lieben Zeilen, richtig lieb! Ja, Dina und Masterchen hatten mehr Lust, unser Haus urgemütlich zu machen, Zimmer umzuräumen und teilweise auszubauen, und dann mussten wir die Gemütlichkeitszimmer auch gebührend genießen. Außerdem haben wir Birdwatching nach einem Kurs “Birdwatching for Dummies” entdeckt. Jetzt freuen wir uns sehr auf unseren Ausflug nach Wimpole, das mit Kipling verbunden ist und eine berühmte Bibliothek hat. Masterchen schenkt der lieben Dina und uns Buchfeen diese Woche Leben im Herrenhaus, da wir ihm so lieb geholfen haben. Nee, wir gehen uns nicht verloren, darauf achten wir aufmerksamen Kleinfeinfeen schon. La dolce far niente – was gibt es Schöneres! 🙂 Wie schön ist es doch, nichts zu tun/und dann vom Nichtstun auszuruhn! Wir besuchen u.a. die berühmte Wimpole Library, die als die bestproportionierte Bibliothek gilt (1730 von James Gibbs gebaut). Ich denke mir, wir werden darüber berichten. 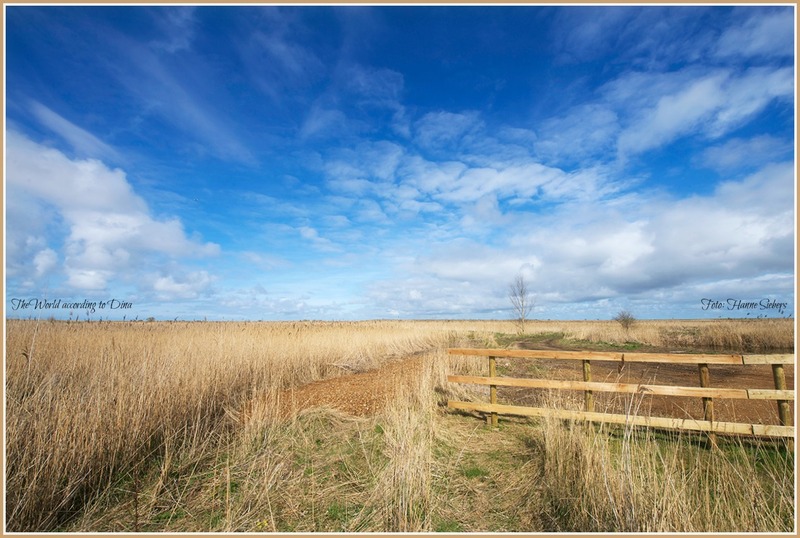 Ooooh the lovely marshes, what a great photo, Dina! you are right, actually we did quite a lot: we walked a lot and did some birdwatching (very new for us), worked in the garden, and made our house soooo cozy. Dina told me about your great walks in the marshes, it sounds and looks absolutely wonderful, dear Fab Four. Say hello to beautiful Cambridge, take care, have fun! Ah….the luxury of doing nothing! Auch dir ein superfeines Wochenende und hab’s rundum schön. Glorious place via your lens! The sky, clouds, field, … just spectacular!! Ein sehr ansprechendes Foto! Gefällt mir sehr! Habt einen schönen Urlaub, und ich freue mich schon, wenn es danach mit dem “Birdwatching” weitergeht! brrrr, was für ein scheußliches Wetter heute, kalt und still nieselt es vor sich hin. Aber zum Glück soll’s ab morgen wieder schön sein – sonst werden auch Siri und Selma Petrus in die Hölle schicken. we suppose this wide-openness has a healing effect, it’s cleansing and opens the mind and the feelings. North Norfolk has this magic of wide skies, wide marshland, wide beaches, and the wide sea. since my days as a student I fell in love with Halldór Laxness. Thanks a lot for this quote which is a perfect description of the grandeur of the Arctic. Laxness is at his best when describing the nordic landscapes (of Iceland), well, for you it’s quite far south, isn’t it?! Here is Cley it’s cold as well: 9 degrees C only and a little rain. But for tomorrow warm and sunny weather is forecasted again. By the way, are you at home again? Hello friend, have a great week ahead. thank you 🙂 We wish you a great week to come. I wish I could just walk into that picture…my drream. Enjoy your trip all of you! We wish you happy days next week. Beautiful photo and thanks for the wissings. Doing nothing is hard work. Rest well. indeed! Great that you understand us. we are very much looking forward to our week’s holiday. I look forward to your post on birdwatching. What better way to spend one’s time than observing birds? Better late than never. Yes, my husband and I have been birdwatchers for eons, but not the kind that go out on a Sunday with their kneesocks, binoculars, and telescopic lens cameras, and then forget about it until next year’s bird count outing. We are always aware of the birds around us. They are part of our life every day in some small way. You do live in a bird paradise. So glad you’ve discovered that at last. And we do carry binoculars and zoom lens cameras, but that isn’t done to identify us, but rather to identify the birds. I’m sure you’ll be the same, with a genuine interest in the birds and their habitat. It'd be so lovely to go for a walk into our marshes with the two of you! Yes, it would be so nice to have an outing like that together. So much to see! We are just beginners but we are starting to run around with a our binies as well. We are lucky that there are so many courses about birdwatching here and we get a lot of help identifying birds. But sometimes we just like to watch, even if we don’t know what we are seeing, well, we have our problems with identifying. yes, indeed, these marshes are full of mystery. Did you know that they inspired Sir Arthur Conan Doyle to write “The Hound of Baskervile” (we blogged about in our old blog: https://kbvollmarblog.wordpress.com/2012/01/18/black-shuckwolf/). Quite a lot of authors were inspired by all these ghost and mystical stories we use to tell our visitors. And don’t forget, for many, many years the locals lived of smuggeling and were pirates. The Captain of the Bounty, William Blight, came from our next little marked town and is burried there (Wells next the Sea). This landscape produced such a special history and vice versa we see this landscape in a special way because of its history. That is a lethargy inducing view, so I don’t blame you all…..enjoy! 🙂 Look forward to the birdwatching post with anticipation. are you a birdwatcher as well? Paul Theroux’s books about his journeys and about the primary colours belong to our favourits. We will visit Wimpole Estate and Anglesey Abbey where we can see the history of the English gardens and a great library. danke sehr für deine lieben Wünsche. Morgen geht’s los. Wir sind schon ganz aufgeregt, obwohl unsere Ziele Wimpole und Anglesey Abbey gar nicht weit von hier entfernt liegen. I love the views of your area (as well as Dina’s photographs, of course!) but have a question: since it is marshland, do you get billions of mosquitoes in the Spring/Summer??? we have no mosquitoes at all, maybe because it’s saltmarshes, and we have a constant wind from or to the sea, and huge flogs of insect eating birds. But my neigbour has a sweet water pond in his garden and no mosquitoes neither. My theory: We are too near to the sea and have such a lot of birds at all seasons. We will visit Wimpole with its famous gardens and library and Anglesey Abbey, actually both places are only a 2 hours drive from Cley, but we will stay there for a couple days and surely will have fun. Thank you for the clarification, dear Klausbernd: sounds like the ideal place for me! Unfortunately where we are in Connecticut there’s quite a few mosquitoes in the Spring/Summer time despite our living by the ocean… Oh well. Your short vacation sounds wonderful: have fun and relax! Irgendwie lieben wir die Stimmung in Cambridge. Diesmal geht’s nach Wimpole (4 miles von Cambridge) und es ist toll, dass unsere liebe Dina in Cambridge studiert hat und sich deswegen dort bestens auskennt. For sure it is! There are a lot of freedom and space for them. I’m looking forward to your new post! I wish you four a great week! We can understand your decision. Yes, blogging takes up so much time, therefore we will not blog regularly every week any longer. Sweet. Happy holiday. Can’t wait to see you both again. This is such a gorgeous shot! Enjoy your time in Cambridge – such a beautiful town. We are just on our way to Wimpole, just 4 miles outside Cambridge, the weather is great, and we are happy. Well Fab Four, that’s one beautiful photo. What a splendid shot into that blue yonder . . . enjoy your holiday! YES! Therefore Siri and Selma are sooo happy here. Nothing quite like relishing in the laziness to prepare for another adventure and enjoying life ~ beautiful photo above that I could lay in those fields for days and just smell that fresh air and be quite content. Cheers! What can I do to get there extremely charming!